As a step to increase ship safety in Arctic waters, cruise operators that are members of AECO (Association of Arctic Expedition Cruise Operators) is introducing a satellite based vessel tracking scheme for vessels associated with the association. The scheme is called "AECO Vessel Tracking System"
AECO has decided to require members to participate in a vessel tracking system. This regards members operating SOLAS-vessels (passenger vessel of certain size). Today AECO launched the system and approximately 20 vessels with operations in Arctic waters are connected to it. These vessels and their operators can at any time easy log onto a website and get information about the other vessels, including name, position, course and speed. 'The AECO Vessel Tracking System is another step to increase ship safety in Arctic waters. Intelligence about other vessels, their positions and plans are important parts of the risk assessments operators are carrying out as part of their Arctic operations planning' says Frigg Jørgensen, Managing Director of AECO. 'The operators will get easy access to the tracking information. For authorities this will be useful information and it creates redundancy on other systems that monitors ship movements. In connection with Search - and Rescue (SAR) operations we believe this system can give important additional information' Jørgensen says. The scheme can also be used for coordination of sailing plans with the objective to keep some distance to other vessels. 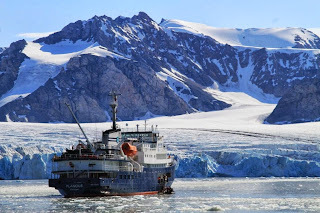 AECO is following IAATO (International Association for Antarctic Tour Operators) who has made an equivalent scheme mandatory for IAATO-members operating vessels in Antarctica. The already existing AIS-system (Automatic Identification System) also gives information about the ship traffic and especially with the European AIS satellite running (in a test period), authorities already have an overview of the ship traffic in Arctic waters. The cruise industry does not, however, have access to AIS-information, except for nearby vessels. Through the AECO Vessel Tracking System, the cruise operators can get information about each other, regardless of their positions. AECO's Vessel Tracking System is not open to the public, but in addition to vessel operators connected to the scheme, relevant authorities will be given access if they require it.